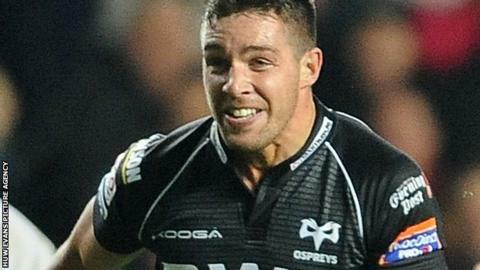 Wales scrum-half Rhys Webb has signed a new three-year contract with the Ospreys. The 24-year-old's current deal expired at the end of the season and he has now committed to the region until the end of the 2015-2016 campaign. "To be able to commit to another three years with my home region is fantastic," Webb said. "It's a brilliant environment here, the only place I want to play rugby." Webb added: "I take great pride in wearing the Ospreys shirt. We've got a good, young group of players together here that can serve the region well for a long time and I'm pleased that I can be a part of it." Webb has this season been second choice to Kahn Fotuali'I, who will join Northampton Saints in the summer after rejecting a new deal at Ospreys. Bridgend-born Webb came through the age-grade ranks at the region before signing his first development contract ahead of the 2007-2008 season. His senior debut was as a replacement against Ulster in March 2008 with his first start two months later against the Newport-Gwent Dragons. Webb has scored seven tries in 87 appearances for the Ospreys and has won three senior caps for Wales having made his debut against Italy in 2012. Having represented Wales at Under20 level, he was also a member of the Welsh squad that won the Sevens World Cup in Dubai in 2009. Webb is the latest Ospreys player to commit to the region with Joe Bearman,James King and Lloyd Peers also signing new deals.